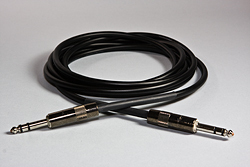 Our Ultra BC00's are balanced 1/4" trs to 1/4" trs cables. Cable is Canare L-2T2S and the 1/4" trs are G&H Copper Tipped plugs. This cable is available in black only. You can choose different color shrink wrap to go at the cable ends.